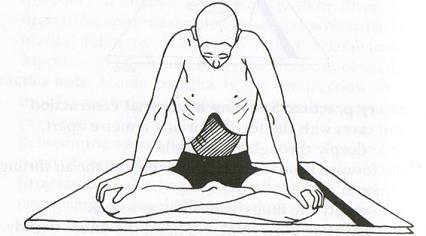 (Sanskrit: उड्डियान बंध, Uḍḍiyāna Bandha) is the abdominal bandha described and employed in hatha yoga. It involves, after having exhaled all the air out, pulling the abdomen under the rib cage by taking a false inhale while holding the breath and then release the abdomen after a pause. The process is repeated many times before letting the air into the lungs, resuming normal breath. Practical note: Uddiyana Bandha can only be practiced on an empty stomach. The bowels should preferably be empty. Psychological effects:Removes lethargy and soothes anxiety and tension. A continuous practice unusual inner strength, willpower and determination. Energy affects: The process activates Manipura Chakra and relate fire element (Taja Tattva). Helps to direct prana into the path ao Sushumna Nadi, allowing it to flow upward to Sahasrara. 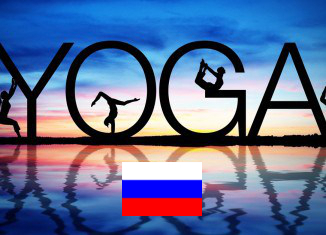 Uddiyana Bandha has an extremely strong sublimation effect,raising the vital and sexual energies from Muladhara and Swadhisthana Chakras toward the superior planes. With some practice, the energy from the lower chakras can be used to specifically activate of the higher chakras. Physiological effects: Uddiyana Bandha is a panacea for many abdominal ailments and diseases:constipation, worms, diabetes, etc., provided that they are not chronic. Stimulates the digestive fire, strengthens,tones, and massages all abdominal organs. Balance the adrenal gland. Improves the blood circulation in the entire torso. The powerful physical and energetic effects can lead to increased longevity. Contraindication: Colitis, stomach or intestinal ulcer, diaphragmatic hernia. Glaucoma and raised intracranial pressure. Let MESSAGE not be Lost !